Published by Inner Traditions / Bear and Company under the Healing Arts Press imprint, this book has a fairly simple premise: plants are important, and without them we suffer. I have a special fondness for the wild, medicinal plants (not that vegetables aren't cool, they are just a little tame by comparison), and the more I've researched these botanicals and used them in my clinical practice, the more I've found that a simple, daily, preventive approach is the key to success. Herbal medicine doesn't have to be rocket science - though it is a rich, beautiful, and extremely complex endeavor. Its basic premises are easy to grasp and can quickly bring benefit. So in this book, I've tried to highlight how whole-plant, wild-plant medicine is important, accessible, and simple by outlining three classes of medicinal plants that are universally found in traditional healing systems. I explore the science behind how they work, but also use stories, history and mythology interwoven in the narrative to provide meaning and context to herbalism. Finally, through practical examples, I give my take on a few safe, effective, weedy and wild plants (and one fungus). 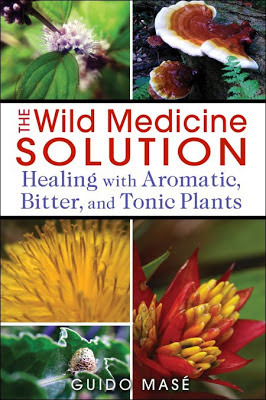 For more information on The Wild Medicine Solution, check out the Inner Traditions catalog page. Find the book on IndieBound (along with local bookstores that carry it), Amazon or Barnes and Noble. "...if you want a deeper understanding of the benefits of bitters, I highly recommend a new book by herbalist Guido Masé called The Wild Medicine Solution: Healing with Aromatic, Bitter and Tonic Plants." "With a clear writing style and pithy summations of medical research, he makes it evident why we should care about heart rate variability, the relationship between cortisol levels and saponin-rich herbs, and the important role the bitter flavor plays in regulating insulin levels. (...) Masé is at times lyrically poetic, and yet he provides enough hard evidence to support his theory that (...) perhaps, by restoring our relationships with the flavors of the wild, we will usher in a new evolutionary phase. I'd like to think he's right." 9/16/13: Been a little remiss posting information here. Next event is at Healthy Living in Burlington, VT on September 23rd at 6pm. After that, looking forward to Philadelphia and Washington, DC in the month of October! An interview with The Natural Nurse. A two-part interview on Tributaries Radio: part 1, part 2. An interesting article in Publisher's Weekly on the literary repercussions of the American insurance market and the Affordable Care Act. 4/15/13: Next event is at Phoenix Books in Burlington, VT on Thursday, April 18th at 7pm. Would love to see you there! Please stop in and say hi. 3/20/13: Book reading / signing event at Bear Pond Books in Montpelier, VT on Tuesday, March 26th at 7pm. Come by to say hi and join the conversation. "In The Wild Medicine Solution, Guido presents a beautiful tapestry of writing that weaves together the colorfully rich tradition of herbal medicine around tonics and bitters, which are among the most important classes of botanicals for human health. Great information—A delightful read—The real solution to the health care crisis!" "Herbalist Guido Mase elegantly weaves his own story with the history of herbs and science, and human history and biology with the history of herbal medicines, offering us compelling reasons to re-harmonize our lives with nature and reintegrate herbs as medicines into our lives all wrapped up in a good read and beautiful presentation." "A 21st century herbal filled with the wisdom of authentic herbalism. Not only are vital skills of herbalism imparted in a friendly and grounded way, the book brims with insights and wisdom from a herbalist who truly walks his talk. Well done Guido!" "There are those who incorporate everyday plants into their diet, knowing this is herbal healing at its best. Guido Masé goes one step further. Here’s the science that makes clear why direct plant medicine rocks. Tonics, bitters, and aromatics enliven our meals as well as stimulate our life force. Read this book and dare to be healthy!" 1/30/13: From Rachel Corby, UK medicine woman, gardener & author of The Medicine Garden & 20 Amazing Plants. "Was best herb book I have read in a long time. I fully recommend it." 1/26/13: A review from Michael Tierra, author of Way of Herbs, Planetary Herbology and founder of the American Herbalists Guild. "Guido Mase's new book brings together a body of knowledge and wisdom from a synthesis of diverse long standing herbal traditions to reinstate the timeless value of medicinal herbs as "special foods" to be incorporated as part of a wholesome diet. He focuses primarily on three classes of herbs, the aromatics such as peppermint, garlic, linden, Ginger and Lemon balm for their ability to defend the body from harmful pathogens and to relax nervous tension and anxiety, the Bitters including dandelion, burdock wormwood and yellow dock which by gently challenging our digestive system serve as a much needed antidote to the overly processed and sweetened foods that currently are the cause for most of the chronic diseases of Western society; and finally the much misunderstood tonics including chocolate, astragalus, red reishi mushroom and hawthorn that have served to nourish and support a healthy body-mind for millennia before the concept of a vitamin or nutritional supplement in a pill, much of which, ironically enough, are manufactured from petro-chemicals by pharmaceutical companies and sold to supplement manufacturers for distribution. I highly recommend this book not only for its content but like other books such as Michael Pollan's Botany of Desire or the late herbalist Michael Moore's classic series on the herbs of the Western seaboard, Guido Mase's book is a joy to read and is interspersed with exquisite herb photographs that seem to capture the spiritual essence of the plants he describes in his book. I identified with our proud Italian heritage from the opening paragraphs of the first chapter. My grandparents and parents were mostly from Southern Italy and I never forgot how my step grandparents, who didn't speak a word of English, when taking a drive in the surrounding pastoral counties of Los Angeles, would leap out of the car with excitement as they filled their bags full of "verduti" -- mustard greens which they'd boil up altogether and drink in the spring as a "blood purifying tonic" -- probably to antidote the diet consisting of pasta morning, noon and night with other things but just plain in the morning. The important twist on the role of herbs in the human diet, the artful manner of expression that gave a real presence in the book is really wonderful. " "In The Wild Medicine Solution, Guido Mase' offers an elegant yet accessible framework for using herbal medicine: Mase' suggests that three classes of herbs - aromatics, with their soothing and uplifting qualities; bitters, which function as digestive stimulants; and nourishing tonics - are uniquely suited for balancing the physical and psychological stresses of modern life. He offers several examples of herbs in each of these categories; many, like ginger and chocolate, will be familiar even to readers who don't have a background in herbalism. Mase' offers lots of practical information - like simple recipes for each herb - and also deftly places the use of these herbs in the context of recent medical history as well as thousands of years of traditional herbalism. This book offers insights for even experienced herbalists but - with a writing style that is both articulate and conversational - The Wild Medicine Solution will appeal to anyone looking to get or stay healthy in a challenging world." 11/27/2012 There is a short excerpt now available. Thank you for your interest and support. Let's spread the word about the importance of botanical remedies; let's heal wild plant deficiency syndrome; let's advocate for herbal medicine as a birthright for everyone. The green and wild world is part of us. Guido, I am so excited to have ready access to the brilliance, deep insight, and compassion of your teachings. Can't wait to read the book! chocolate with medicine a few days later....relief. hormonal hangover my body is suffering. That with other supportive practiotioners of kinesiology and getting off the bio-identicals but the herbs are powerful their is no doubt. I am grateful for your book and all your good work! My friend, Nathalie Kelly, recommended your website because of my long term interest in herbalism and food. I am deeply impressed with your work, approach and incredibly comprehensive body of knowledge. Loved the Phoenix Books lecture and will order your book immediately from my indie bookstore. I opted to follow you on googleplus and would look forward to any scheduled visit to the San Francisco Bay Area.